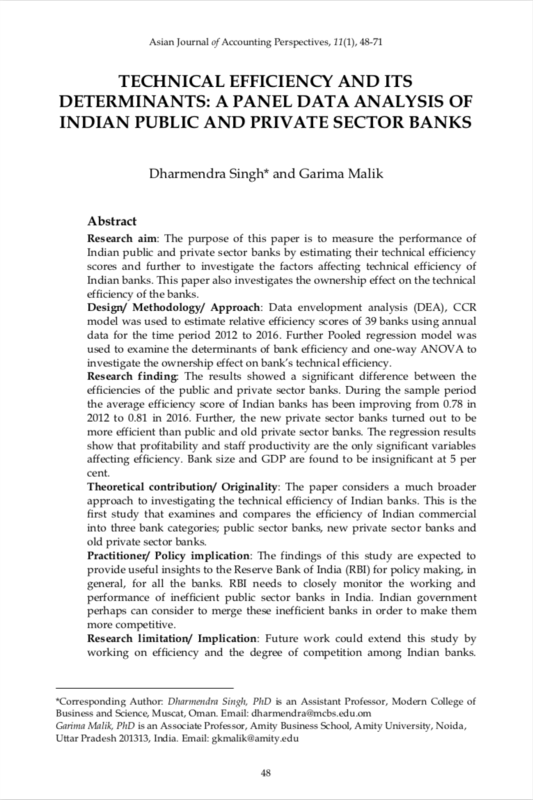 Research aim: The purpose of this paper is to measure the performance of Indian public and private sector banks by estimating their technical efficiency scores and further to investigate the factors affecting technical efficiency of Indian banks. This paper also investigates the ownership effect on the technical efficiency of the banks. Design/ Methodology/ Approach: Data envelopment analysis (DEA), CCR model was used to estimate relative efficiency scores of 39 banks using annual data for the time period 2012 to 2016. Further Pooled regression model was used to examine the determinants of bank efficiency and one-way ANOVA to investigate the ownership effect on bank’s technical efficiency. Research finding: The results showed a significant difference between the efficiencies of the public and private sector banks. During the sample period the average efficiency score of Indian banks has been improving from 0.78 in 2012 to 0.81 in 2016. Further, the new private sector banks turned out to be more efficient than public and old private sector banks. The regression results show that profitability and staff productivity are the only significant variables affecting efficiency. Bank size and GDP are found to be insignificant at 5 per cent. Theoretical contribution/ Originality: The paper considers a much broader approach to investigating the technical efficiency of Indian banks. This is the first study that examines and compares the efficiency of Indian commercial into three bank categories; public sector banks, new private sector banks and old private sector banks. Practitioner/ Policy implication: The findings of this study are expected to provide useful insights to the Reserve Bank of India (RBI) for policy making, in general, for all the banks. RBI needs to closely monitor the working and performance of inefficient public sector banks in India. Indian government perhaps can consider to merge these inefficient banks in order to make them more competitive. Research limitation/ Implication: Future work could extend this study by working on efficiency and the degree of competition among Indian banks. There is also a scope of doing research on impact of service quality dimensions on technical efficiency of banks in India.